Vatral Kuzhambu is an authentic South Indian recipe. This is a tangy and delicious gravy with vatral cooked in tamarind extract blended with the spice of sambar powder. Vatrals are nothing but Sun Dried Vegetables. 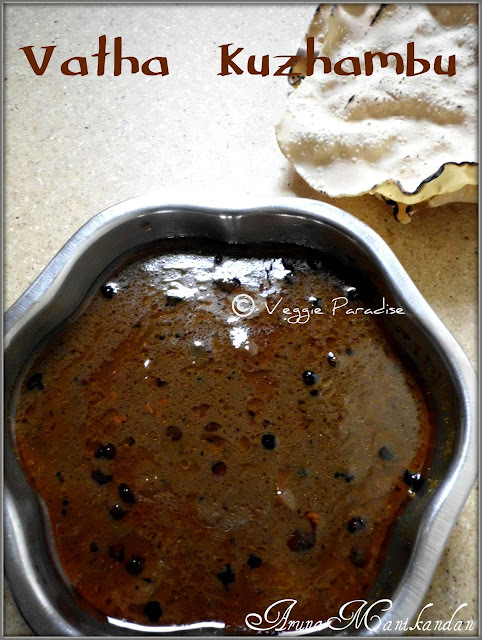 There are many kinds of vatrals, but the ones most commonly used are Sundakkai and Manathakkali (I used both for this recipe). Serve this kuzhambu with rice and Sutta Appalam. Add the vatrals and fry them until golden brown. 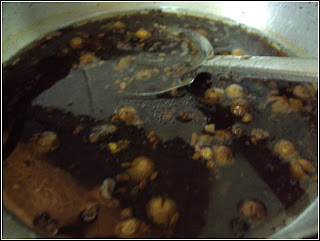 Now pour the tamarind extract ,add sambar powder and salt. Cook on low heat until thick and bubbly. 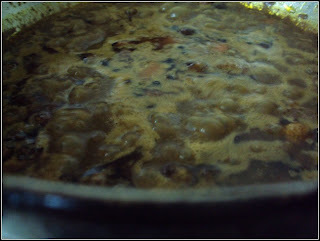 Finally add jaggery and cook for a min. 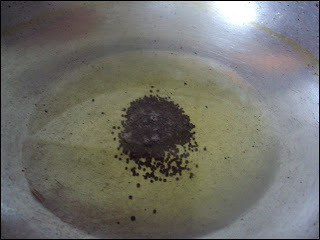 The Kuzhambu consistency should be slightly thick, if you can't get it then add 2 tsp. of rice flour and allow to cook. You can add 1 finely chopped tomatoes , this is optional. I love Vatral kuzhambu so much that I need only this to have rice..Nice recipe Aruna. wonderful curry, looks yummy n perfect with hot white rice.. I too love this dish..You have done it perfectly..mouth watering ! Thanks 4 commenting on deepsrecipes. 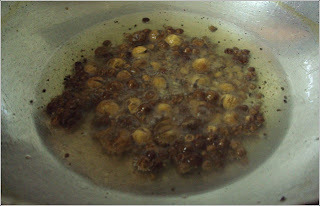 I dont make often vatral kuzhambu to avoid over eating ;) that much I love it! Looks so tempting! more than me, my hubby loves this. thanks my search ended here. 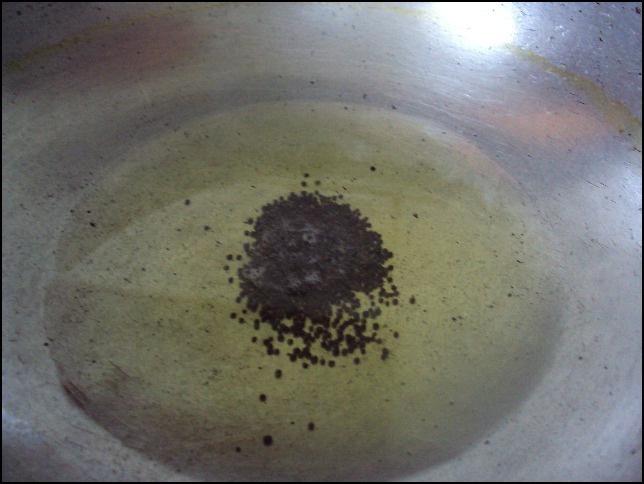 The vatra kuzhambu looks so tempting with all that oil floating on top, can have it with some rice and appalam..
Hello Aruna, thanks for your lovely comment on my blog. The vatral Kuzhamby looks delicious. I remember the whole house would have the aroma of the fried vatral. No need to call out to anybody to come for lunch or dinner. everybody will come automatically. wow...vatha kuzhambu looks more tempting...nicely done!! Yummy and mouthwatering one. Love it so much with some hot rice and pappad. YUM! mmmm.... my favorite.. Looks yumm. Thanks for dropping by Aruna. I LOVE vatral kuzhambu, with paruppu thogayal! 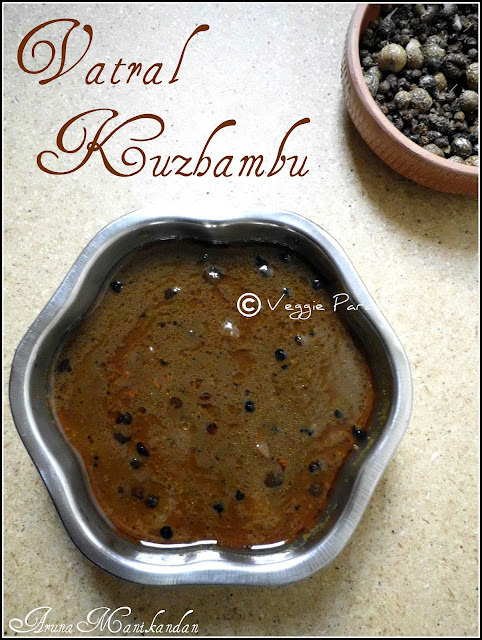 I have not had the opportunity to taste Vatral kuzhambu yet but will definitely try it one day. Your pictures perfectly convey how finger-licking tasty this dish must be. this looks delicious. I love the tangy taste of tamarind and jaggery. What type of sambar powder did u use? home made or ready made? Looks so good! Will try it out soon..
Luvly n mouthwatering Vatral Kuzhambu Dear.So yumm. another tongue tickler - looks SUPERB!